Take your children on a mesmerizing journey through the universe! Enter a planetarium dome and be introduced to a “star filled” sky! 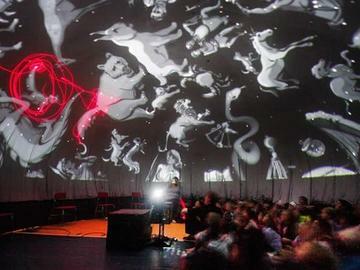 With the use of a digital planetarium projector, children will be guided through the stars of the Northern Hemisphere exactly as they appear on the day of a show. In a fun and interactive atmosphere, children will learn how to identify planets in our solar system in dramatic “flights” towards each world. They will be introduced to Greek mythological characters and see how these heroes of the past can be found in the stars. They will witness the night sky in different seasons and from different global perspectives. For Adults and Children Ages 4 and Up. Children ages 5 and up are welcome with an accompanying adult. Children ages 3-4 may attend with one accompanying adult required for each child. Children age 2 and under are not recommended. Participants must crawl through a short tunnel with reduced lighting to access the inside of the dome and remain seated throughout the 45-minute presentation. Space is limited, and a separate ticket ($10 per person) is required for each visitor. Tickets are non-refundable. All proceeds go towards the Performing Arts program at Starbright School. The Performing Arts program at Starbright encourages students age 3 years and older to discover and develop their talents for dance, choir, and musical theater. The programs are led by a one-of-a-kind faculty who are not only terrific teachers, but also talented artists in their own fields. Choir and Dance students perform in the Annual Concerts to showcase their accomplishments. All Starbright Musical Theater classes culminate in a production of a musical. Starbright Theater produces 15-20 musicals per year starring students ages 3-14.